Back in the 1970s and 1980s there were many commercials with jingles and slogans you just never forget. Oh-so-many, right? Who could forget the Clairol Loving Care ads and TV commercials that took the South Pacific song, "I'm gonna wash that man right out of my hair" and switched it up to, "I'm gonna wash that GRAY right out of my hair!" 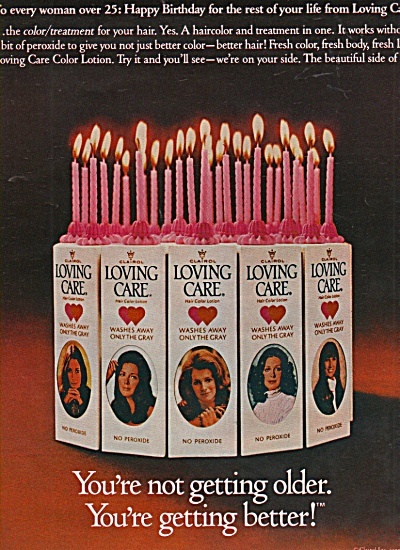 Funny how we '80s girls were so young back then -- we never imagined ever having to color our hair to hide gray. Only old ladies go gray. Wah!!! 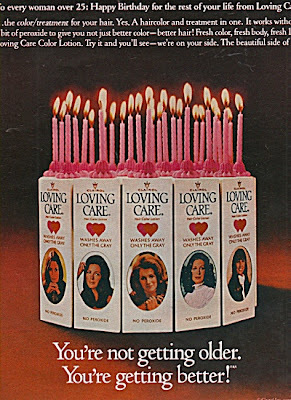 Watch this 1980s commercial for Clairol Loving Care and wash that gray right out of your hair! Video will not play on my computer. But love this jingle now I'm singing it in my head.